I think the color is right, maybe a bit less red.... I think it is more maroon. 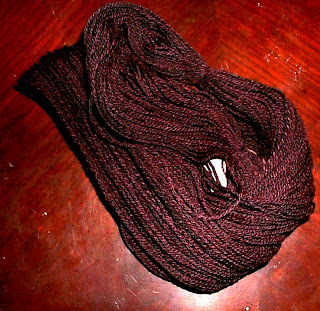 Anyway, this skein was spun from a dark brown fleece I bought from Terry Mendenhall at the state fair (I love this fleece! In fact I bought the fall shearing too :) I have been playing with it, doing different things and I decided to try a dye job. I mixed Cushings wine and scarlett colors and viola! A really pretty, rich maroon. I just loved the way it came out! 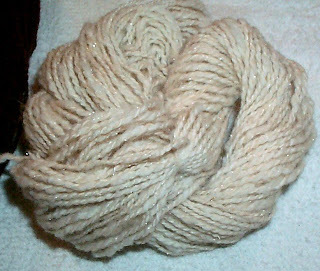 I have dug up the other skeins of this Rambo/Romney cross wool and am going to play some more :) More pictures to follow! You wouldn't believe (or maybe you would) how much wool, how many different kinds of wool, I have in my stash that is just begging to be blended with other wool in my stash and spun up into something beautiful! I started last night (couldn't finish my dinner cause it was on the table screaming at me) with some of Wayne's wool, a merino I believe, some torte angora bunny, and white angelina. 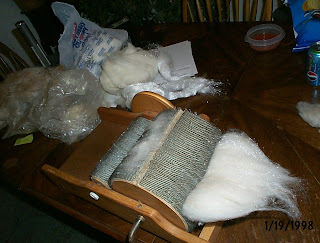 You may be thinking at this point (at least I was) that I have never used a drum carder before, how can I possibly be thinking about blending at this stage!?!?!? Well, I couldn't help myself. 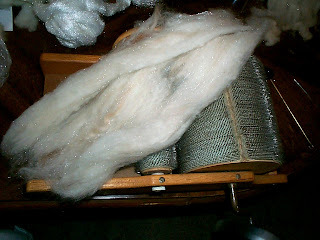 I have been sitting on this wool for over a year and wanted so bad to see that angelina blended with the merino. Actually, the entire blend was to be a very short cashmere, a boat load of angora, the merino and the angelina, so I really did take it easy. 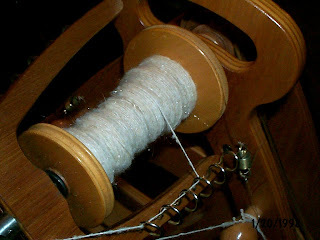 I started with the merino, ran it through twice (sorry, some of Wayne's wool is neppy...) and on the third run, I added angora, you can see it in the middle of the batt here, a very pretty torte (my favorite angora color), then ran it again with bits of the angelina. One more time through and off to the wheel! Hiya! I found you through Michelle @ Boulderneigh. What a great blog! I saw you mention about grazing to Lauren...I live in Flagstaff AZ and actually am lucky enough to have green pasture with a stream running through. Our place is small, but I can still let the sheep graze a bit even now. I haven't met anyone else here who does have actual green pasture. It sure makes a difference in the hay bills and the lambs have nice green-stuff to eat in the spring IF it isn't under snow! Flag is a nice place, my DH is from Oracle, just out of Tucson. I think the biggest concern I would have living around there is cactus contamination of my wool lol! In Oracle you would have had to deal with fire ants, too. ;-) I love the color of the yarn! Thank you! You should see it in person! I dyed another skein with navy blue with a touch of ocean mist, I have to buy batteries for my camera and will take more pictures later today or tomorrow.